Which Tooth Veneers Are Best? If you're thinking about getting veneers for teeth that are dull, crooked or chipped, you're probably looking for some detailed information! A lot of my patients ask me about getting tooth veneers for teeth that have some sort of cosmetic problem. But what are tooth veneers? I usually describe veneers as being like thin shells of porcelain or acrylic, that are fitted to the fronts of your teeth. They are a bit like false fingernails, only tooth-shaped. You can have just one tooth veneered, for a particular problem, or ALL your teeth veneered, or any number inbetween! In the photos above, the young lady did not like how her teeth were uneven, and the shapes were out of proportion. 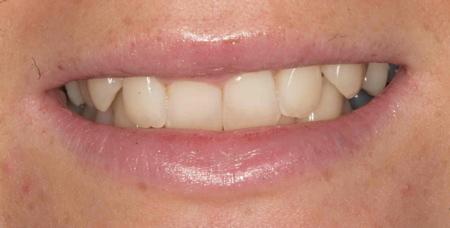 This was due, in part, to some teeth not developing properly; she was missing some teeth, and the remaining teeth had moved around to fill the gaps, but resulted in an uneven appearance. 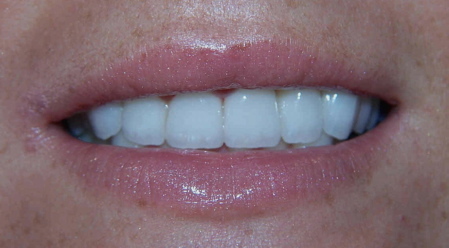 With some veneers for teeth like this, we could make a nice change, and give her a beautiful smile! Veneers For Teeth - What sort of problems can you solve? Problems with tooth color. To be honest, modern teeth whitening methods can deal with almost any type of tooth discoloration. SNOW tooth whitening is the current best product for home use that you can buy online, in my opinion. Of course, dentist-supplied whitening products are better, but also more expensive. SNOW tooth whitening gives you professional-quality results at a lower cost than going to the dentist. But sometimes the problem only affects a couple of teeth, and after tooth whitening you can still see some differences between the teeth. Problems with tooth position. Normally, the best treatment for teeth that are out of line is braces (orthodontics). But sometimes, even after orthodontic treatment, you still have some irregularities or spacing. Problems with tooth appearance. The tooth enamel may be pitted, irregular or badly stained. In all the cases above, getting veneers for teeth with problems will allow your dentist to correct the situation. He can make all the visible teeth the same color, he can straighten out any irregularity in tooth position, and of course the veneers cover the enamel surface, so any pitting or chipping of the enamel is hidden. What about the cost of veneers? How many veneers you need. What material the veneers are made of, for example ceramic veneers. How and where the veneers are manufactured; lab-made or Cerec veneers, made by a high-tech CAD/CAM machine. What (if any) temporary veneers you have. How much your dentist charges for his time and where he is located. Usually, Cosmetic Dentist Veneers will be more expensive. What's involved in getting veneers? Getting veneers for teeth that need a makeover usually involves the dentist taking away some of the tooth enamel on the fronts of the teeth being treated. This is to make room for the veneer. Sometimes, this enamel removal can be minimal, especially if we want to build the teeth up a bit (ie. make them slightly thicker). At other times, it may be possible to avoid removing any enamel at all, for example when using Lumineers. These are an ultra-thin type of veneer manufactured by a firm called DenMat. 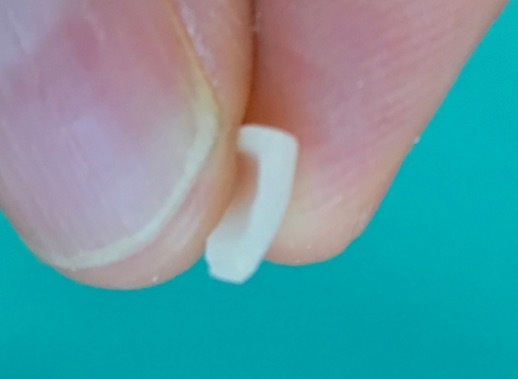 They claim to be the thickness of a contact lens. However, Lumineers are not suitable for everyone, and would give an un-natural appearance when used in the wrong situation. In general, getting your teeth veneered means having some tooth enamel removed. This is a permanent change. It cannot be reversed. The enamel cannot be put back on. BUT, the new veneer will take the place of the enamel, and look way better! After your teeth have been trimmed down, your dentist will make you some temporary veneers to fit over your teeth. The temporary veneers will give your teeth a natural appearance while the permanent porcelain veneers are being made in the dental laboratory. But there's nothing as strong as the original enamel. Despite all our advances in many areas of dentistry, we still don't have any materials that last as long as natural tooth enamel. SO, if you get veneers, you need to know that they will NOT last forever. On average, veneers for teeth will last around 10 to 15 years before needing replacement. BUT you need to keep your veneers REALLY CLEAN. The best way to do that is with a high-quality sonic toothbrush. Get a GOOD-QUALITY electric toothbrush. But don't get any electric toothbrush - GET MY TOP-RATED BRUSH, THE CYBERSONIC 3. If you use my special DISCOUNT CODE you can get the Cybersonic3 at around HALF PRICE - that's just $50 ! Why would a veneer need replacing? When I say that a veneer lasts 10 to 15 years, I don't mean that it suddenly drops off after a period of time! For most people, what happens is a slow process of deterioration. The gum may start to shrink back a little, exposing the edge of the veneer. The edges of the veneer may start to get stained. The biting edge may start to get worn and chipped. 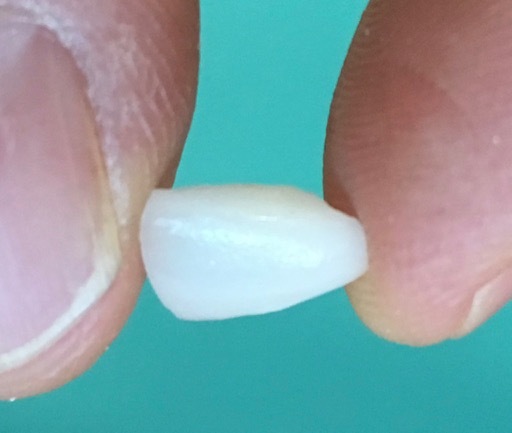 It's also possible for a larger chunk of veneer to fracture off. So at some point down the line, you will need to get your veneers re-done. With luck, the first set could last over 20 years. But if you are under 40 years of age, you will have to reckon with getting your veneers re-done at least once in your lifetime, if not twice. This is not a major problem. But you need to know about it before making the decision to get veneers. When are tooth veneers NOT suitable? You only want whiter teeth. Here, the better solution is simply good-quality teeth whitening. If you have tried teeth whitening before, and had problems with the teeth not getting white enough, or with sensitivity, you either need to find a dentist who uses either KoR Whitening or WyTen Whitening, OR take a look at the brilliant take-home system from SNOW tooth whitening. These products WILL whiten any teeth, with MINIMAL or NO sensitivity. This option is much cheaper than getting veneers, AND you don't need to worry about getting it all done again in 10 - 15 years! Severe crowding of your teeth. If your teeth are REALLY crooked, it's going to be very difficult for the dentist to give you straight teeth just by putting veneers on them. Usually, some teeth will have to be cut down quite a lot, to make room for the veneers to be straight. This aggressive grinding can damage the nerve inside the tooth, leading to root canal treatment. In this situation, it's MUCH BETTER to get some tooth-straightening first. You can either go the whole hog and get braces for as long as it takes to get your teeth the way you want, OR you can compromise a little, getting your teeth straightened up just enough to allow tooth veneers to be an option without aggressive tooth reduction. One excellent tooth positioner is called the Inman Aligner, developed by Donal Inman. This is being used more and more, particularly in the U.K. by cosmetic dentists Dr. Tif Qureshi and Dr. James Russell, among others. Very minor problems with tooth position or color. Again, with modern techniques such as Invisalign or ClearStep, you don't have to get the full wire braces for three years. These new treatment methods allow you to wear transparent retainers over your teeth that can correct small problems within months. Any remaining spaces or discolorations can be treated with tooth whitening and composite bonding. Some dental offices that offer "Six Month Smiles" or "Six Month Braces" also throw in a free tooth whitening kit! You can read all about this quick, affordable and simple technique at the link above. Getting veneers for teeth with cosmetic problems can result in a fantastic-looking smile! But they need careful planning to get the best appearance. Make sure your dentist has looked at ALL the other options as well, and explained them to you fully. With modern computer imaging techniques, it is possible to take some photographs of how your teeth look now, and then edit the photos to show you how they COULD look after treatment. The Canadian Dental Association has an informative page on veneers.